No one was injured after part of a pedestrian bridge collapsed in Toronto's Crescent Town neighbourhood early Saturday. 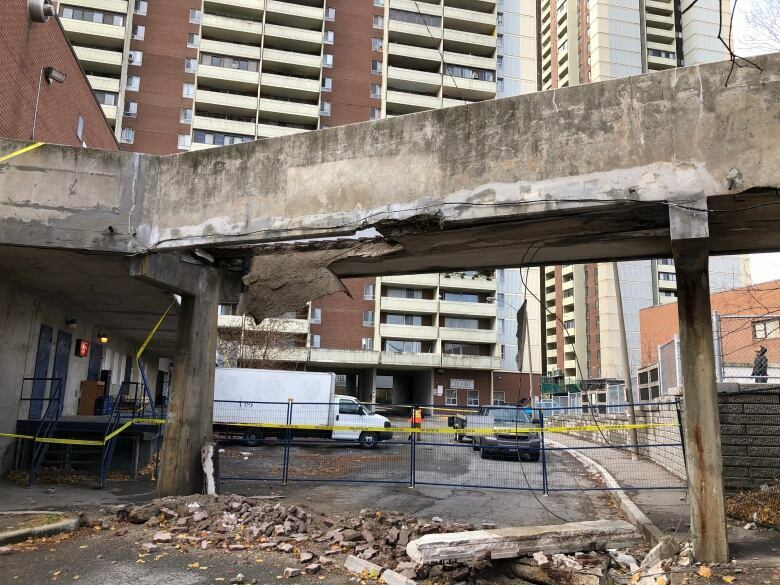 No one was injured after part of a pedestrian bridge collapsed in Toronto's Crescent Town neighbourhood early Saturday, police and firefighters say. Concrete from the underside of the bridge at Massey Square fell to the ground below, according to Capt. David Eckerman, spokesperson for Toronto Fire Services. The bridge, near Victoria Park Avenue north of Danforth Avenue, is a walkway to Crescent Town Elementary School. It is raised five metres above the ground. Emergency crews received a call about the collapse at 6:22 a.m. The concrete landed on the driveway of a condo building, Eckerman said. Firefighters put up caution tape around the bridge and the area underneath it to restrict access. Temporary fencing has also been set up around the rubble. "We made the area safe," he said. Firefighters have notified police, the city and the Toronto District School Board about the collapse. 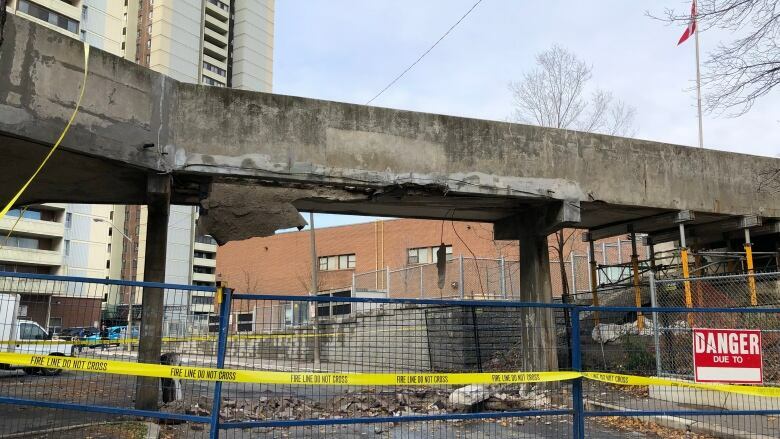 The TDSB told CBC Toronto that their staff have secured the school end of the bridge and that they have reached out to the owner of the portion of the bridge that collapsed to determine what to do next. "We are thankful that nobody was injured in this morning's incident," TDSB spokesperson Ryan Bird said. "We will be advising parents that the bridge is not accessible until further notice." Mayor John Tory visited the site on Saturday and said he's thankful the collapse didn't happen when the area was busy. He also said he learned that there had been complaints about the bridge before and that were repairs done about a year ago. "My main concern at this stage is to make sure that the kids can get to school safely on Monday and after that because I doubt this bridge will ever be back in commission," Tory said. "If somebody had been walking across here on a weekday going to school — and I gather it's dozens and dozens, if not hundreds of kids — it would've been a real tragedy."